Seventh in a series of miniature books featuring a selection of poems referencing color, by Emily Dickinson. The Work of Her that went, The Toil of Fellows done –– In Ovens green our Mother bakes, By Fires of the Sun. Accordion structure, hand painted boards. Gold stamped leather band. Letterpress printed on dyed Cave flax paper. Dutch gilt cover sheets, Collaged, sewn center insert. 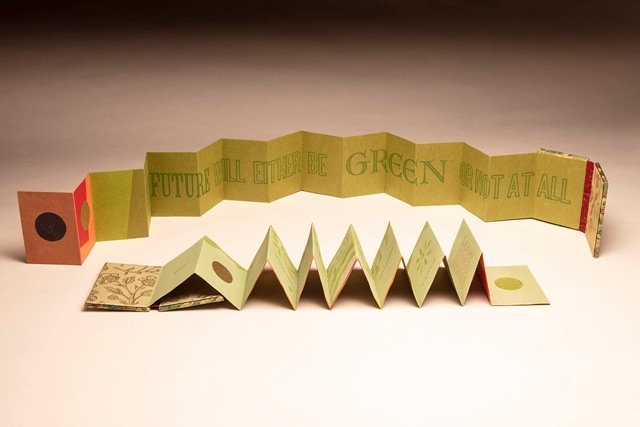 Verso, printed in green on Moriki paper with antique wood type: “ The Future Will Either be GREEN or Not At All.” Box of hand stenciled paper and Japanese silk with E.D. blind stamped on the spine. Gold stamped leather title on the cover. 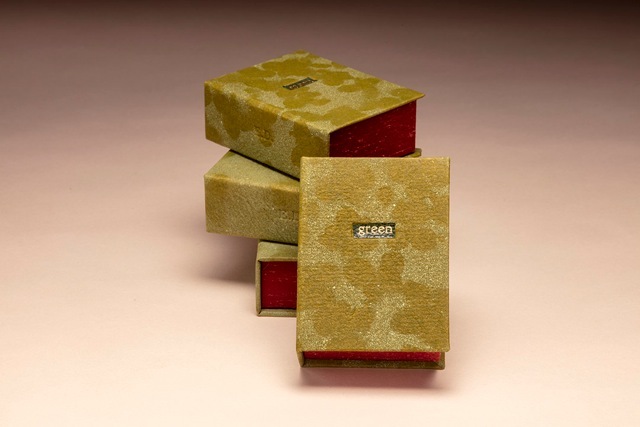 The book measures 2x3 inches, The box, 2 1/2 x 3 1/2 inches. Created in an edition of 6.